We’ve spied it testing at the Nurburgring, in patent photos, snapped on Instagram and even leaked as a model car – but today the worst-kept secret in sports cars has been announced officially: this is the new Porsche 911 GT3 RS. And it’s just as spectacular as we’d hoped. 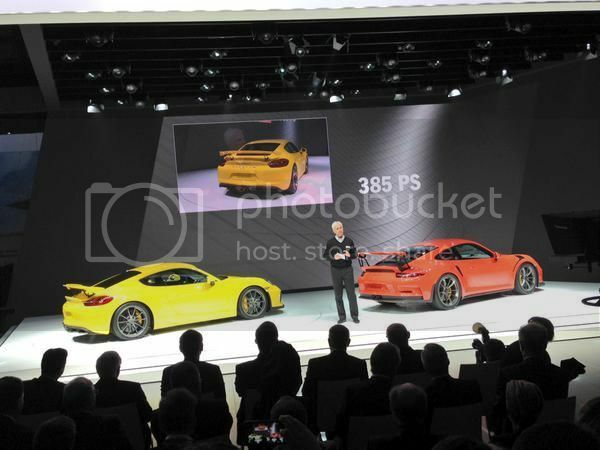 Porsche's Andreas Preuninger talks us round the new Porsche 911 GT3 RS. They’re worth waiting for. Engine: four litres split between six cylinders generating 493bhp and 354lb ft. That makes it the most powerful non-turbo 911 in the range. 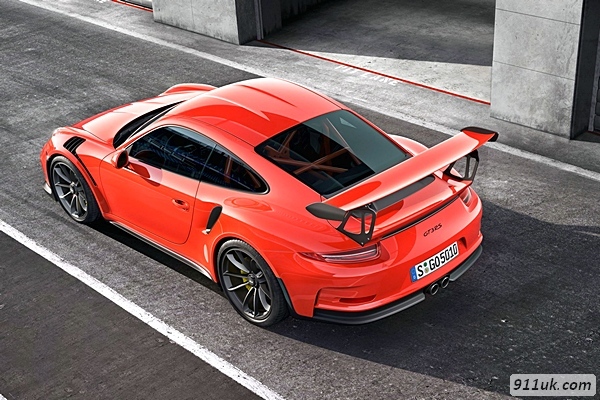 Here’s another quite significant figure relating to the GT3 RS: seven minutes 20 seconds. That’s how long it takes it to get around the Nordschleife, making it nine seconds quicker than the Porsche Carrera GT supercar. This is a very fast car indeed. 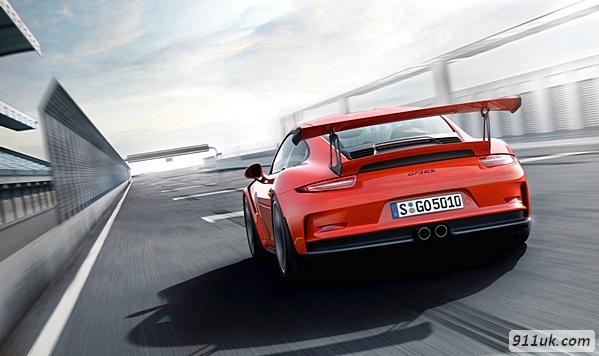 What separates the RS from the ordinary Porsche 911 GT3 on the technical front? It’s wider, for a start. Those broad arches cover wider front and rear tracks, and the RS also wears the widest tyres of any current 911 road car. No wonder it can corner so hard. The roof panel’s made of magnesium, and the bootlid and engine covers are carbonfibre. Those vents atop the front wheelarches – as predicted in that model car – are there to help increase downforce over the front axle, Porsche says. Meanwhile, the flattened bit up the middle of the bonnet is intended to be reminiscent of that of old 911s, when it used to lead to an air intake. Gears are swapped by a development of Porsche’s PDK dual-clutch transmission, with an on-demand neutral function designed to replicate a kick of the clutch pedal. Just in case. Like a few other 991 Porsches, it features a rear-wheel steering system, subtly swivelling the rears to aid low-speed turn-in and high-speed stability. The seats are more or less the same as those of the 918 Spyder supercar, and nestling behind them is a bolt-in rollcage. If customers don’t take their RS near a track, Porsche is clearly going to be disappointed in them. Especially as the options list includes a six-point harness, fire extinguisher mount and master cut-off switch. When can I buy one? And how much does it cost? As of today, right now. If interested, hotfoot it to your local Porsche dealer with £131,296 handy. 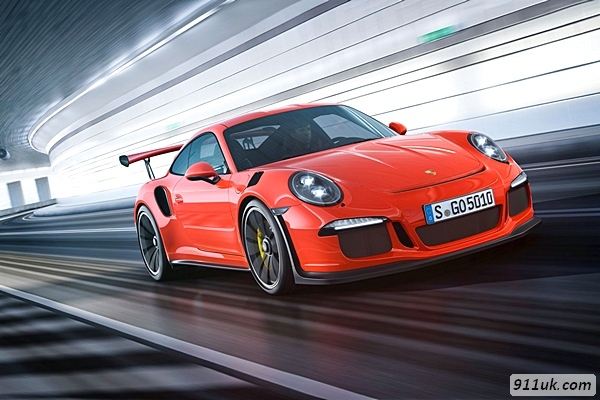 Porsche has equipped its new 911 GT3 RS with a 4.0-litre version of its naturally aspirated six-cylinder boxer engine boasting the same 493bhp as the similarly configured unit used by its predecessor, but with an additional 15lb ft at 384lb ft. Unveiled at the Geneva show prior to going on sale in the UK in May at a price of £131,296, the pared-down road racer is based on the latest 911 GT3. The GT3 RS is clothed in a modified aluminium body borrowed from the 911 Turbo. In order to save weight and lower the centre of gravity, it has a new magnesium roof structure and a bonnet and engine lid fashioned from carbonfibre-reinforced plastic. The bonnet and roof each feature a 30cm-wide indent down their centre line in a look reminiscent of that seen on earlier air-cooled 911s. The engine lid has additional cooling elements and an integrated ducktail-style spoiler aimed at increasing downforce at speed. The aerodynamic package also includes a prominent splitter element, modified front wings with integrated air ducts to lower the pressure in the wheel house and reduce front axle lift, and a large, adjustable rear wing. Despite the adoption of the wider 911 Turbo’s bodyshell, the 911 GT3 RS’s kerb weight of 1420kg — 10kg under that of the standard 911 GT3 — endows it with a power-to-weight ratio of 347bhp per tonne. 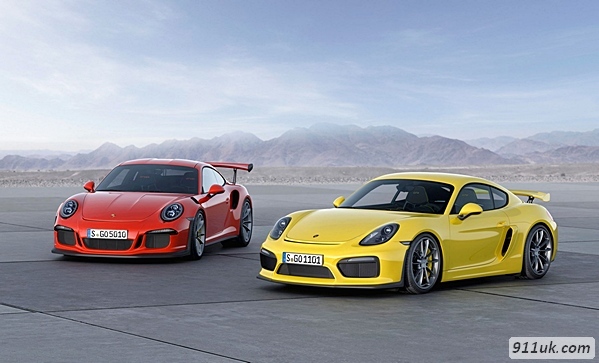 This gives it a claimed 0-62mph time of 3.3sec — 0.6sec faster than the old 911 GT3 RS — and a 0-124mph time of 10.9sec. Top speed varies according to the amount of downforce dialled into the rear wing, although Porsche officials suggest it will crack 200mph in low-downforce guise. 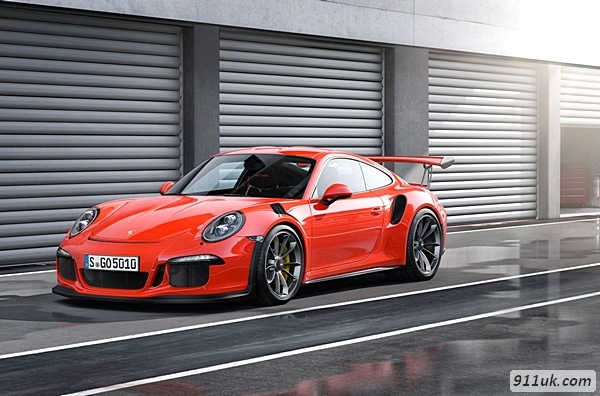 Details of the extent of the changes made to the 4.0-litre engine used by 911 GT3 RS remain under wraps, although its 493bhp and 384lb ft are 25bhp and 60lb ft more than that produced by the 3.8-litre powerplant found in its standard sibling, making it the most powerful naturally aspirated engine yet to be fitted to a road-going version of the iconic 911. Drive is sent to the rear wheels through a reworked seven-speed dual-clutch automatic gearbox and fully variable locking differential with an integrated torque vectoring function. 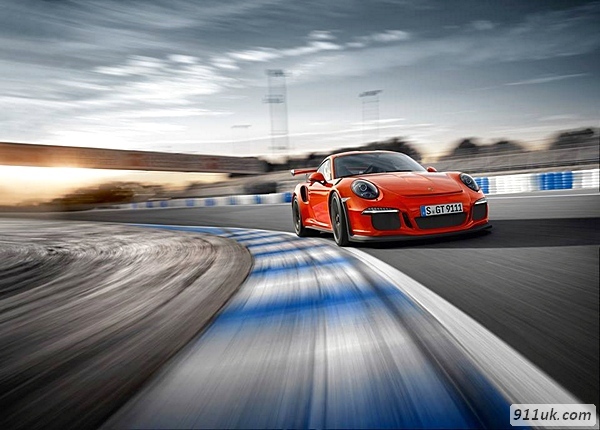 Porsche claims the new 911 GT3 RS is capable of lapping the Nürburgring in just 7min 20sec. Motorsport technology in its purist form is epitomised by the front wheel arch air outlets of the lightweight carbon wings. With 12 slats, they provide an efficient exit for the air drawn into the front wheel arches. This reduces the overpressure created by the turning wheels and thereby counters lift. It’s an aerodynamic detail with road approval, otherwise found only on racing cars like the RS Spyder. The result is extra downforce, generated together with the aerodynamically styled front end and the 911 GT3 RS-specific front spoiler. At the limit, the air rapidly thins out. That’s why the new 911 GT3 RS has two air intake openings for the engine – on the left and right in the rear side sections. 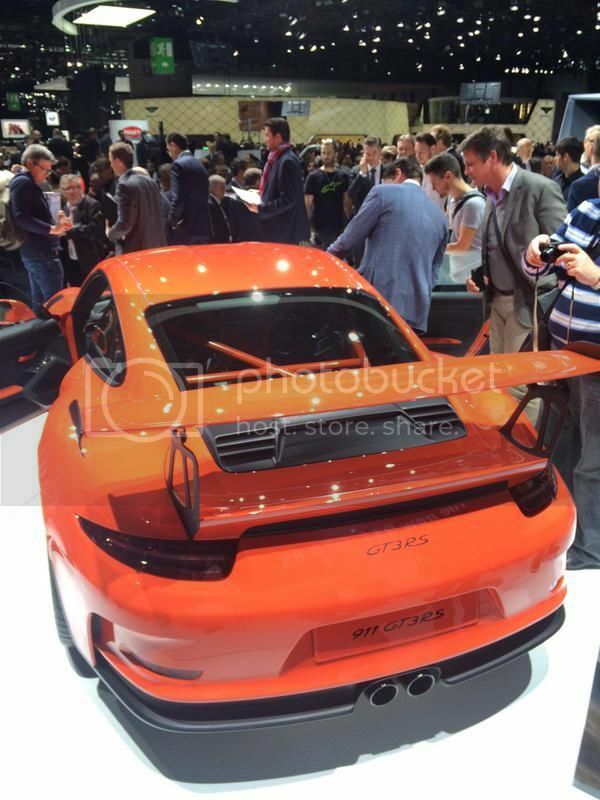 At the rear, the new 911 GT3 RS is muscular in appearance, aggressively so when seen from the side. The 21-inch wheels on the rear axle not only improve the footprint, traction and lateral dynamics, they also help to provide a slight forward pitch, which hints at the car’s hunger for acceleration. Another unique characteristic of the new 911 GT3 RS is the surface contouring of its lightweight magnesium roof and carbon luggage compartment lid. The cooling air intake grilles are coated in titanium colour. The carbon rear lid has wing uprights in forged aluminium and a rear wing, also made from carbon. The indicators, daytime running lights and position lights are designed with LED technology. SportDesign exterior mirrors embody lightweight construction. The rear silencer in titanium is characteristic. The Clubsport package comprises a roll cage bolted to the body behind the front seats, a six-point racing harness in red supplied ready to install on the driver’s side, a ready-to-install fire extinguisher with mounting bracket and preparation for battery master switch. This, and the front roll cage elements for race events, are available to purchase separately from the Porsche Motorsport department. At the limit, you need one thing above all: reserves. Not only for power, but for safety, too. This is possible only with a race-proven technology on which the driver can depend at all times. Only this can free up extra room for manoeuvre, especially in the red zone. The new 911 GT3 RS is therefore equipped with a particularly powerful yet lightweight brake system with a specifically matched brake booster. The red six-piston aluminium brake calipers on the front axle and the four-piston equivalents at the rear are designed as monobloc units. This makes them tougher and enables a more rapid response and release of the brake, even under heavy loads. That’s not all. The brake dimensions have been enlarged to cope with the increase in engine power. The brake discs are 380 mm in diameter, not only at the front but also at the rear. Thanks to their twopiece construction with cast iron brake discs and aluminium brake chambers, they reduce weight and thus the unsprung and rotating masses. The brake discs are cross-drilled and internally vented for powerful braking even in adverse weather conditions. Or when pitted against the challenges of motorsport. Fuel consumption* 911 GT3 RS: Urban in l/100 km (mpg) 19.2 (14.7); Non-urban in l/100 km (mpg) 8.9 (31.7); Combined in l/100 km (mpg) 12.7 (22.2); CO2 emissions in g/km 296. The engine of the new 911 GT3 RS sits just above the tarmac. At the rear end, of course. With its low centre of gravity, it was predestined for motorsport. Indeed, this water-cooled six-cylinder unit with four valves per cylinder, VarioCam and dry-sump lubrication with a separate engine oil tank could not be more ideally equipped for its role. 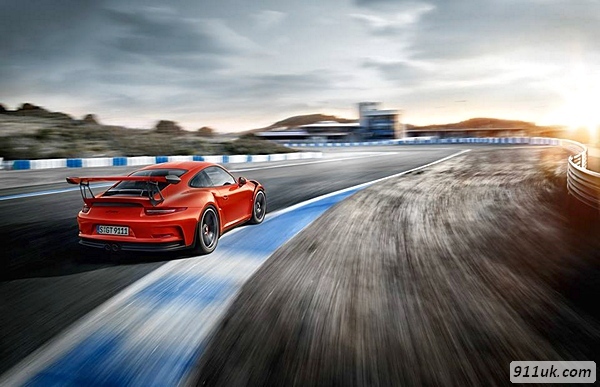 The high-revving concept promises exceptional power, offering a maximum speed of 8,800 rpm and delivering one result: the new 911 GT3 RS pushes relentlessly forward – in pursuit of ever new frontiers. 100 % focused on new sporty territory, it generates 460 Nm at only 6,250 rpm and achieves a maximum power output of 368 kW (500 hp) at 8,250 rpm. Particularly lightweight titanium connecting rods facilitate the engine’s impressive speed development. 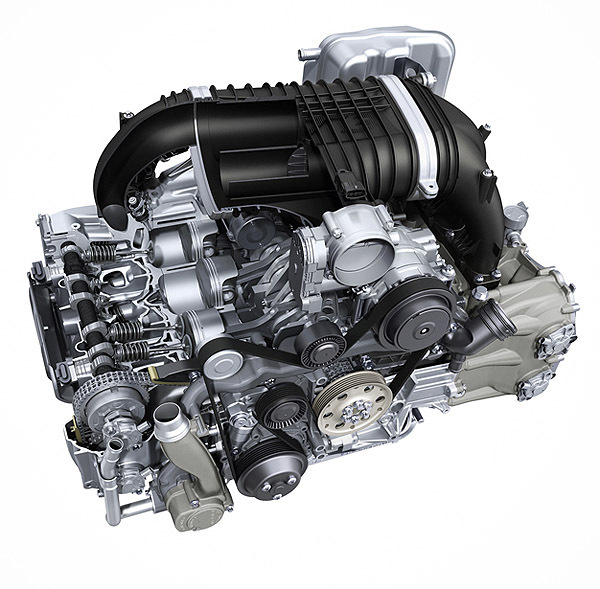 The engine draws its power from a capacity of 4.0 litres. This equates to a power output per litre of 92 kW (125 hp), and acceleration that simply knows no limits: the sprint from 0 to 62 mph is completed in a mere 3.3 seconds. So it should hardly come as a surprise that competitors on the racetrack will see little of the new 911 GT3 RS other than the rear. While the Vmax value of 192 mph is impressive, it isn’t the decisive factor. Motorsport is primarily about the ability to summon powerful acceleration, endure lateral forces and take advantage of balanced aerodynamics with high downforce. Delivering such extraordinary power would not be possible without a low weight-to-power ratio. 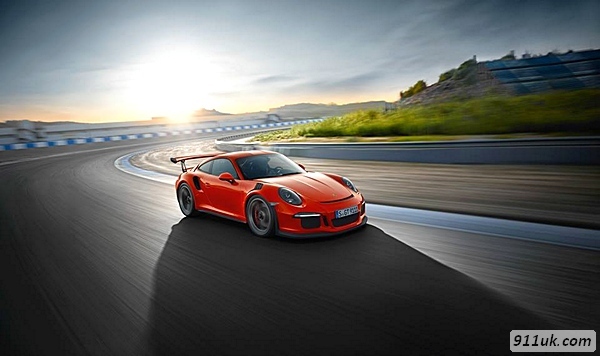 With the new 911 GT3 RS, it’s as low as 3.86 kg/kW (2.84 kg/hp). The short gear ratios of Porsche Doppelkupplung (PDK) also play their part. These increase pulling power and acceleration potential in all seven gears. Direct fuel injection (DFI) makes a decisive contribution to the efficiency of the engine – and its power output. It does so with millisecond precision and a pressure of up to 200 bar, providing optimum mixture formation and combustion in the combustion chamber along with a reduction in consumption and CO2 emissions. In concrete numbers, fuel consumption has been reduced by 0.8 mpg by comparison with the predecessor model. The engine oil supply is vital at the limits of sporty performance, especially in the presence of the powerful lateral and longitudinal forces that can be experienced on the racetrack. Two oil scavenge pumps per cylinder head and two scavenge pumps in the crankcase return the engine oil quickly and efficiently to the external tank. In conjunction with the electronically controlled oil pressure pump, this means that the engine has a reliable supply of oil to the crankshaft drive and both cylinder banks. The 911 GT3 RS is factory-filled with Mobil 1 fully synthetic high-performance oil. The excellent lubrication properties of this oil ensure a reliable cold start, even at very low temperatures, and contribute not least to the durability of the engine. The 911 GT3 RS is equipped with a plastic variable intake manifold. In interaction with the sports exhaust system, it helps to ensure efficient gas cycles and high throughput. To guarantee high torque and power across a broad engine speed range, the conventional distributor pipe in the new 911 GT3 RS is supplemented by a resonance pipe incorporating a flap. The flap opens or closes based on the current engine speed to provide optimum cylinder charge. This results in an impressive torque curve, a high maximum torque level and considerable power output across a broad engine speed range. The sports exhaust system has two front silencers, two catalytic converters and one rear silencer made of lightweight titanium. The large volume of the exhaust system reduces exhaust back pressure and thus increases power output. The two Lambda sensors of the stereo Lambda control circuitry regulate the composition of the exhaust gas separately in each exhaust tract, while another pair monitor pollutant conversion in the respective catalytic converters. The chassis has been engineered to meet the challenging demands of motorsport. 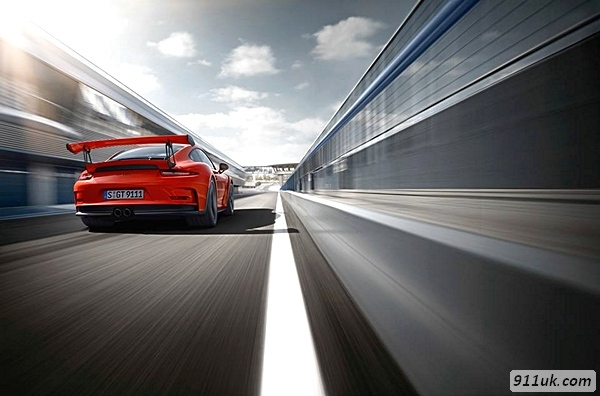 In conjunction with a series of specifically tuned chassis components, this means that the new 911 GT3 RS offers extraordinary agility, a high degree of driving safety and stable handling, particularly in corners. The independent front suspension combines McPherson-type struts with longitudinal and transverse links. The rear axle has a multi-link suspension, following the LSA (Lightweight, Stable, Agile) concept. Height, camber, track and the anti-roll bars can be individually adapted for use on the racetrack. Additional ball joints on both axles help to establish a particularly firm connection between the chassis and the body. An optional lift system raises the front end by 30 mm. Operable up to a speed of approximately 31 mph, it minimises the risk of grounding on kerbs, ramps and car park entrances. Fitted as standard, the new rear-axle steering with sports tuning combines performance and everyday driveability. An electromechanical adjustment system at each rear wheel enables the steering angle to be adapted based on the current driving situation, steering input and vehicle speed. The advantage for day-to-day driving: during low-speed manoeuvres, the system steers the rear wheels in the opposite direction to that of the front wheels. This has the virtual effect of shortening the wheelbase. The turning circle is reduced to make it easier to park. The advantage for sporty driving: during high-speed manoeuvres, the system steers the rear wheels in the same direction as that of the front wheels. Driving stability is increased by the virtual extension of the wheelbase and agility is enhanced by the simultaneous steering of the front and rear axles, especially during overtaking manoeuvres on the racetrack. 20 inches at the front axle, 21 inches at the rear axle. For a wheel size combination, that’s a first in the 911 model range. The larger footprint makes another improvement to dynamic performance. 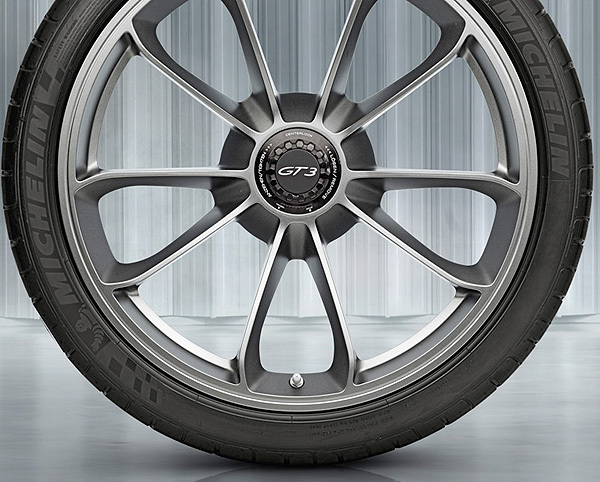 The wheels are made from a forged alloy and feature a platinum-coloured paint finish. The central locking device bearing the ‘RS’ logo is derived from motorsport. Compared with the conventional five-bolt wheel connection, it offers enhanced performance thanks to the reduction in rotating masses. And, of course, it ensures a faster wheel change, which is vital when you’re in the pit and the clock is ticking. The tyre sizes on the new 911 GT3 RS are nothing short of impressive: 265/35 ZR 20 on 9.5 J x 20 at the front, 325/30 ZR 21 on 12.5 J x 21 at the rear. Road-legal sports tyres help to provide the necessary grip. Bear in mind, however, that the reduced tread depth increases the risk of aquaplaning on wet surfaces. 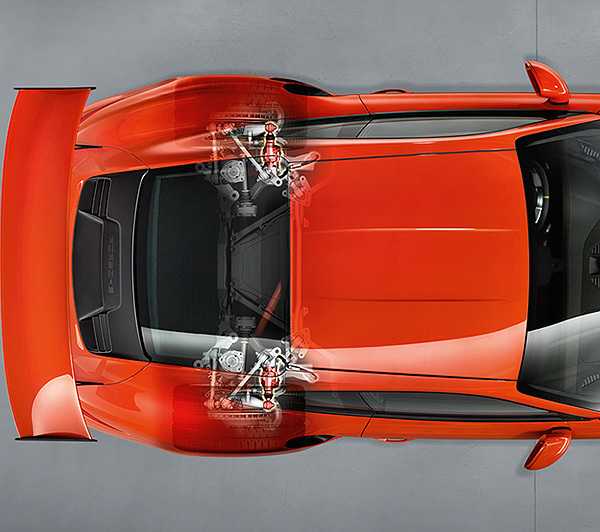 PSM is an automatic control system for providing stability at the limits of dynamic driving performance. In addition to the anti-lock braking system, it includes Electronic Stability Control (ESC) and Traction Control (TC). Sensors continuously monitor the direction, speed, yaw velocity and lateral acceleration of the car. Using this information, PSM is able to calculate the actual direction of travel at any given moment. If the car begins to oversteer or understeer, PSM applies selective braking on individual wheels to restore stability. What’s special about PSM in the 911 GT3 RS? The systems intervene at the limits of dynamic driving performance with exceptional sensitivity and precision. In addition, the systems can be completely deactivated in two stages for deliberately sporty handling. This electronic active damping system offers continuous adjustment of the damping force on each wheel based on the current driving situation and your driving style. At the press of a button, you can select between two different modes. ‘Normal’ mode is designed for sporty driving on public roads and on wet racetracks. ‘Sport’ mode is specially tuned for maximum lateral acceleration and offers the best possible traction on the track. 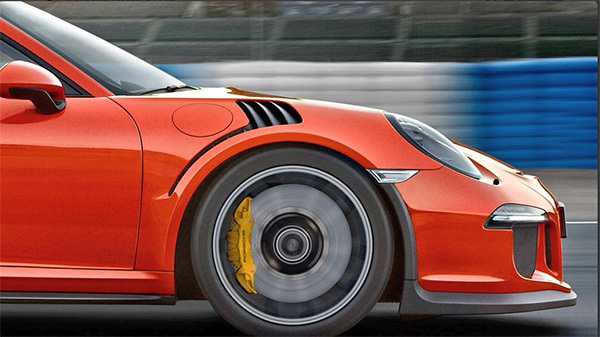 Porsche Torque Vectoring Plus (PTV Plus) is fitted as standard and has been specially adapted to the 911 GT3 RS. It operates in conjunction with an electronically regulated and fully variable rear differential lock. Numerous driving parameter inputs are the basis for the system’s active control outputs. The results are perceptible, particularly at the limits of dynamic performance: greater traction, increased lateral dynamics and a significant improvement in driving stability under the effects of load changes in corners and when the car changes lane. On surfaces with less grip, such as in the wet, the system strategically brakes the right or left rear wheel. This means that, whenever the car enters a corner, brake pressure is applied to the inside rear wheel. Consequently, a greater amount of drive force is distributed to the outside rear wheel, improving turn-in capability and increasing agility. Advanced airbag technology is integrated as standard in the form of full-size driver and front passenger airbags, which are inflated in two stages depending on the severity and type of accident (e.g. frontal or offset frontal). In less serious accidents, the airbags are only partially inflated, thereby minimising discomfort to the occupants. POSIP comes as standard and consists of side impact protection beams in the doors and two side airbags on each side: an integral thorax airbag located in the side bolsters of the full bucket seats fitted as standard, as well as a head airbag incorporated within each door. Additional safety features include the headrests, which form an integral part of each seat, an energy-absorbing steering column, three-point seat belts with pre-tensioners and force limiters and energy-absorbing elements in the dashboard. For all the headlines the Cayman GT4 – rightly – grabbed when it was revealed last month, this is the Porsche Motorsport GT car we’ve been waiting for: the 991 GT3 RS. Building on a recipe that has resulted in nothing but success since 2003, Porsche’s latest RennSport 911 is set to deliver even more of those pure, undiluted driving thrills that only cars from company’s Motorsport department are capable of delivering. Honed and developed by Andreas Preuninger and his team, the new 911 GT3 RS builds on what has gone before and, accordingly to Porsche, is 'equipped with the maximum degree of motorsport technology currently possible in a road legal 911'. In short, this is one of the most extreme Porsche RS road cars since the 1974 3.0 RS. The hard numbers are 496bhp at 8250rpm and 340lb ft of torque delivered at 6250rpm from its 4-litre naturally aspirated direct fuel injected flat-six. The 0-62mph sprint is a claimed 3.3-seconds, with a 192mph maximum speed. As for its Nürburgring lap time, Porsche claims a 7min 20secs, that’s 7sec faster than a Carrera GT and 4 seconds quicker than the 997 GT2 RS. With a 1420kg weight at the kerb it’s 10 kgs lighter than a 991 GT3 despite using the 991 Turbo’s wider – and heavier – bodyshell, and like the GT3 is only available with a seven-speed PDK-S gearbox. The weight savings are attributed to the magnesium roof and carbon fibre front bonnet and engine cover. The new 911 GT3 RS’s flat-six engine is an enlarged version of the direct fuel injected unit found in the regular 911 GT3. Capacity increases from 3799cc to 3,996cc and power by 28bhp with an additional 15lb ft of torque. While the capacity and performance figures are match for the heavenly 997 GT3 RS 4.0-litre’s masterpiece of an engine, this latest 911 RS model is based on the latest DFI flat-six. This latest evolution of Porsche’s Motorsport DFI engine runs the same 12:9.1 compression ratio and 123bhp/litre as the 3.8-litre GT3, but redlines 200rpm lower at 8800rpm. 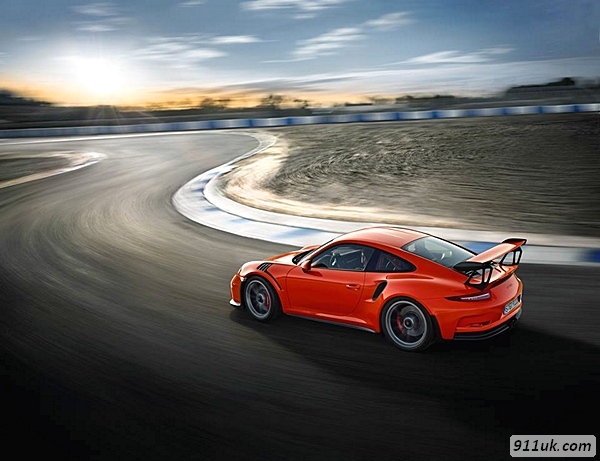 As with the 991 GT3, the new GT3 RS is only available with a seven-speed PDK gearbox. But just like the GT3 the new RS’s PDK ‘box has been developed specifically for the car, with the final drive ratio increasing from 3.97 to 4.19. The new GT3 RS comes equipped with Porsche two stage PASM active damper system, with rear-axle steering and Porsche Torque Vectoring Plus with a fully variable limited slip diff all standard. Both the front and rear tracks are wider compared to a regular GT3 and the 20-inch wheels wear a 265/30 tyre on the front axle, a 325/30 on the rear. The front and rear brake discs measure 380mm, with six piston callipers on the front and four on the rear. PCCB is optional. 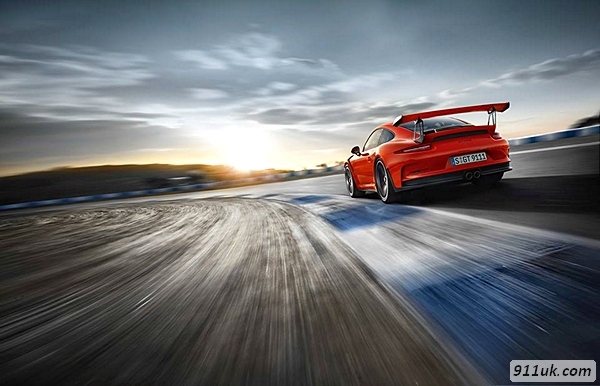 The new 991 GT3 RS follows in the tyre tracks of its predecessor by utilising the wider body of the current 911 Turbo. 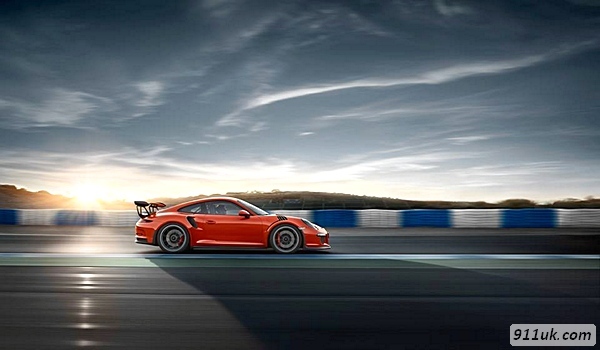 The new 991 GT3 RS doesn’t stop there, however. The roof is made from magnesium and carbon fibre is used for the engine cover and front bonnet. 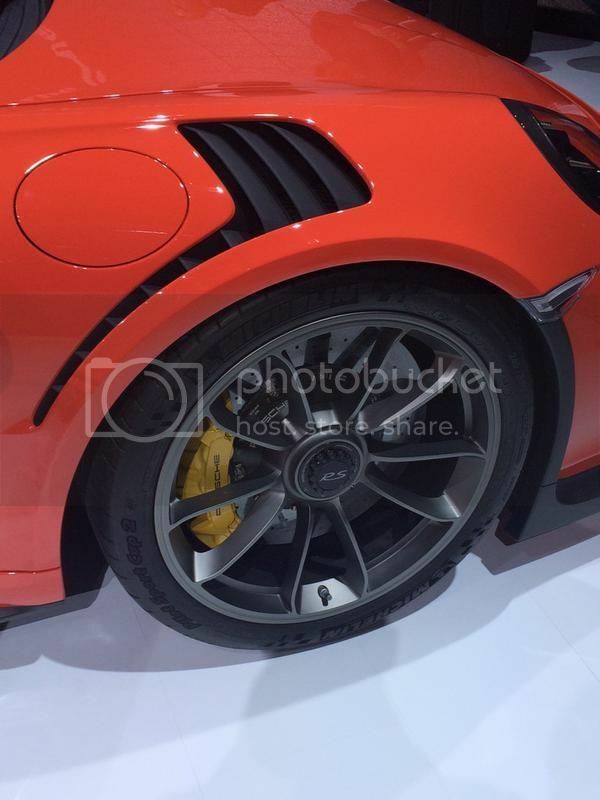 The front wings, as you may have noticed, now also feature air vents to increase downforce across the front axle, and ahead of each rear wheel there is an air-intake for the engine, just as you’ll find on a turbocharged 991. Naturally there is a suitable set of aerodynamic adds on, include a deeper front splitter and towering rear wing. Alcantara is the order of the day inside the new 991 GT3 RS. 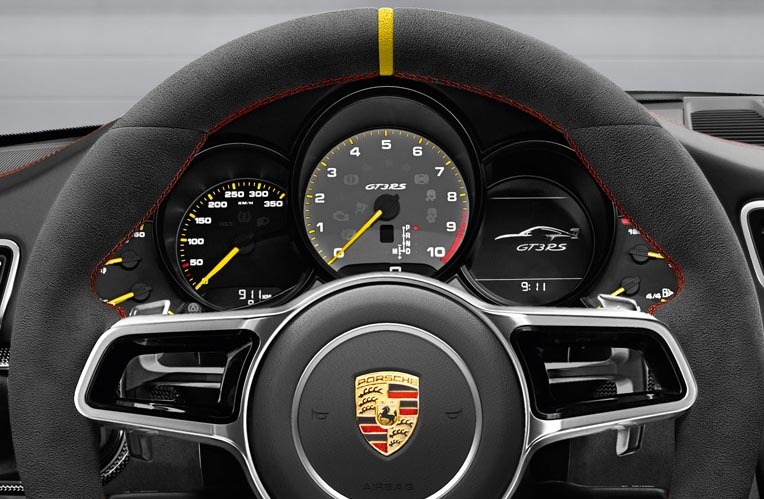 The sports seats are based on the carbon fibre bucket seats first seen in the 918 Spyder, and the steering wheel takes its design cues from the same model. The Club Sport package is standard, and comprises of a bolted-in roll cage behind the front seats, battery master switch preparation with a six-point harness and a fire extinguisher supplied separately. 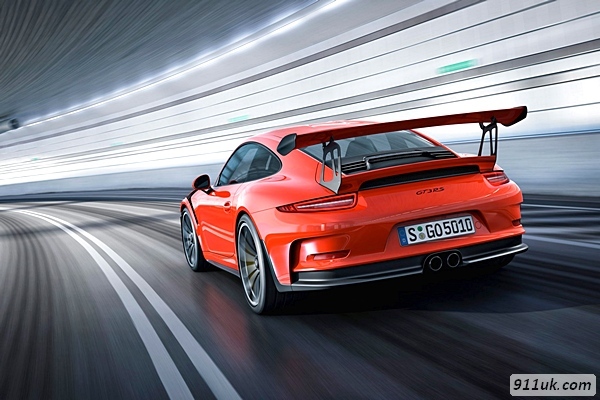 The new 991 GT3 RS arrives in the showrooms in May 2015 wearing a £131,296 price tag, over £30,000 more than a regular 991 GT3. And if you want one, you’ll need to be quick, as demand is expected to outstrip supply when the car goes on sale in May. 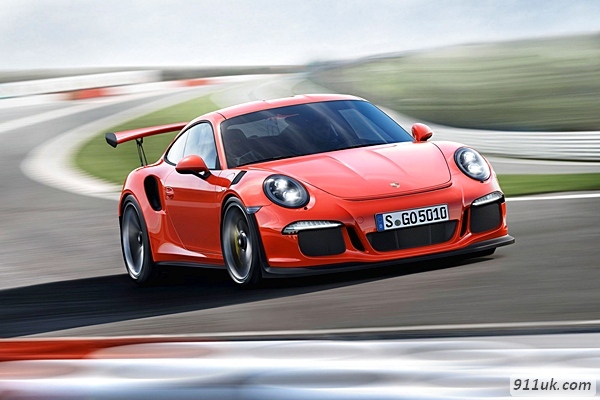 But if past performance is anything to go by the new 991 GT3 RS will be worth every penny. And then some. the call, deposit paid and I've got one ! And to go with the announcement there is also a teaser video, although you don't get to see it. It's all about the GT3 RS this morning, this is the next video actually showing the car a little more, along with a dash display showing it with PDK. Just been unveiled at Geneva in the last hour along side the Caymen GT4 that has obviously already been put out there. Fantastic!... I am actually excited for you. Any idea about a delivery date. Nick - can I have the new one instead? Well done Nick, fantastic car, I don't think there will be many that have managed to bag one. Is there any news on the numbers that will be produced? UK and worldwide?